Ölüdeniz is a town near Fethiye in Turkey, famous for its 'Blue Lagoon'. The village and the beach by the lagoon was locally known as Belcekız or Belceğiz before the area became a magnet for mass tourism, although today many people in the area have no idea about what Belcekız is and the town as well as the lagoon are both known as Ölüdeniz, which literally means "dead sea" and originally referred only to the lagoon itself. Inland to the north, 2 km to Ölüdeniz, are the former villages of Ovacık and Hisarönü, with occasional family-run guesthouses only a decade ago, but are today concrete sprawls of hotels and bars, agglomerated almost without a gap with the town of Ölüdeniz. Both serve as "bedroom communities" that offer accommodation that is close to but cheaper than Ölüdeniz proper. During the peak season in May to October, Ölüdeniz is filled with British tourists. Blue Lagoon in the centre with the surrounding coves and mountains. In the lower right of the photo is the town of Ölüdeniz. 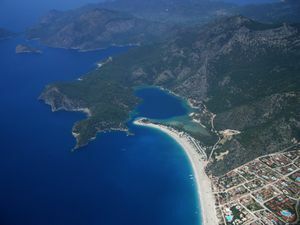 Ölüdeniz is connected to Fethiye with a wide road that is well-paved and is in a very good condition. There is also a very frequent minibus (dolmuş) service between Fethiye and Ölüdeniz. In addition there are lots of taxi's (yellow) who now advertise their prices to each destination. The Dolmus are fine though and only cost 5 TL to get from A-B. From Fethiye, the dolmuş leaves not from the otogar but infront of the nearby red PO petrol station (you can see it from the otogar). It also makes various stops along the main road in Fethiye where there are designated bus shelters. Market: One thing to do while in Oludeniz is to get on the dolmus and go to the market in Fethiye on a Tuesday. There is absolutely everything there (including a lot of fakes). It is a very busy market not only used by holiday makers but by Turks buying their produce. Go to the fish stalls, buy some fresh fish and then go to one of the nearby restaurants where for a few TL will cook it for you. Boat Rental: There are several people along the beach that offer rental of a small motor boat for a few hours. This is a great way to explore the small coves and beaches around the area without having to join one of the larger tour boats that go on a predetermined route. The prices are around 300 TL, expect to pay in cash. There are many different restaurants to choose from, as with anywhere some are better than others. Fresh fish is a favourite which can be found especially in the restaurants on the beach front. One of the longest established restaurants is 'Josephs' (the man in the hat), who always makes everybody welcome and the food is always excellent - try Turkish food though their 'pide' along with various other Turkish choices are wonderful. On the front 'Buzz Beach' bar is always popular and is generally busy all day and evening (which says something). Generally you will not be dissapointed with any of the food, almost without exception all the restaurants will make you feel very welcome. One of the best sights in Oludeniz is sitting at the front in the evening as the sun is going down over the mountain watching the last of the paragliders coming into land. Its fantastic and the sun sets are second to none. 'Crusoes' and 'Buzz Beach Bar' are two of the best to do this. Oludeniz gets busy during the high season, but by around midnight and no later than 2AM the bars are closed. If you wish to party or carry on drinking then you need to go to Hisaronu (about 10 minutes up the mountain in a dolmus), where the bars stay open a lot later. General -'There are around 90-100 hotels in and just outside Oludeniz, ranging from 5* all-inclusives to 2* bed & breakfasts. Not always, but generally you will get what you pay for. Mostly they are all well run. A number of other websites will give you reviews on each hotel. The all-inclusives tend to be a buffet food set-up and much bigger hotels. The smaller 2 & 3* hotels tend to be smaller and more personal, where it is likely that you will get to know the owner and often their family. You will also notice that in many of these smaller hotels the same people return year after year and the owners will treat you as part of their family. As eating out is so cheep in Turkey staying in a 2-3* hotel on a bed & breakfast basis is fine. Butterfly Valley (Faralya) is a remote canyon to the south, on the sea-shore, with some rare butterflies and waterfalls. Boats and minibuses head there from Ölüdeniz. A little further south, at the end of the road is the village of Kabak, which has a canyon similar to Butterfly Valley, although a little easier to access. For a bit of history and a deserted ghost town experience in your trip, take the road to west from Hisarönü and head to Kayaköy, where hundreds of partially ruined houses cover the side of a hill. Ovacık to the north of Ölüdeniz marks the official beginning of Lycian Way, a 500+ km hiking trail leading to Antalya in the east.